Saint John's Eve From 23/06/19 to 24/06/19. Saint John’s Eve (from sunset on 23rd to sunrise on 24th June) is such a magical night that it's also known as the Night of Fire or the Night of Witches. It's the time when we say goodbye to spring and hello to summer. On the Costa Brava and in the Girona Pyrenees, as in the rest of Catalonia, the Saint John’s Eve party (revetlla), forms part of our festive heritage. In every town people gather around bonfires with their family and friends, following ancient (probably pagan) rituals. In many other countries the shortest night of the year is also celebrated with fire taking centre stage. This purifying element is accompanied by music and dancing until the early hours, fireworks aplenty and (in the case of Catalonia) the traditional Saint John’s coca, a sweet bread with custard and candied fruit. There's nothing quite like enjoying a slice around a bonfire. But you can make the night even more of an experience if you join in the celebrations of the arrival of the famous Flama del Canigó (Canigó Flame), that takes place in Girona. This is a tradition of great symbolic importance for Catalans, inspired by Jacint Verdaguer's epic poem. Since 1955, the Flama de Canigó has united Catalonia through fire. 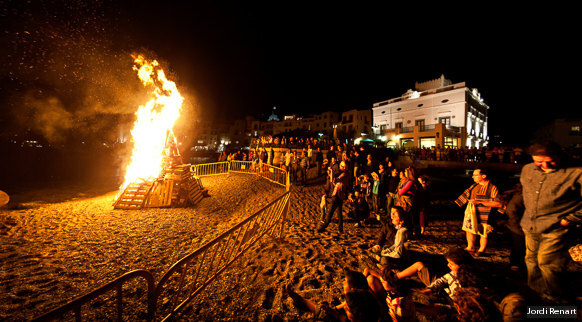 Saint John’s Eve bonfires across Catalonia are lit by torches kindled in the large fire lit at the summit of the Canigó mountain (at an altitude of 2,784 metres) and carried down the mountain in relay. The torch bearers take the flame to every county in Catalonia as a symbol of the survival and vitality of Catalan culture. Wherever you spend Saint John’s Eve, you'll have a great time. Just wander around streets of any town and let the music and firecrackers guide you to one of the open-air parties, where you'll find a warm welcome.